A dumbbell swing can add both a weight training and cardio element to your workout. A dumbbell swing is an exercise that can strengthen your back and abdominal muscles while providing you with a cardiovascular workout that burns calories and boosts your metabolism. Swings like these are often done with kettlebells as well, but a milk jug filled with water or sand to a weight with which you are comfortable can also work. Stand with your legs slightly wider than shoulder-width apart. Hold your dumbbell out in front of you with your arms extended and straight. Hold it with both hands, either one hand over the other or, if they fit, both on the shaft of the dumbbell overhand. You can also hold the dumbbell from one weighted end if you prefer. Bend at the waist and slightly at the knees. Keep your abs tight. Swing the dumbbell down between your legs so that the dumbbell goes behind your buttocks, but at about knee height. 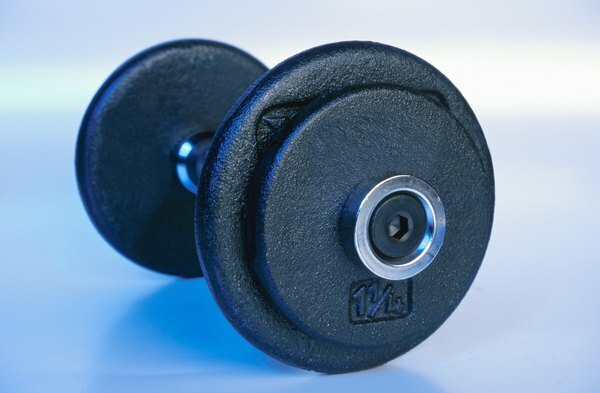 Bring the dumbbell back up to the start position, and repeat between 10 and 20 times as comfortable. Thrust your hips forward and tighten your buttocks as you swing the dumbbell back up to the start position. To perform a high swing, swing the dumbbell up over your head. Increase repetitions as you get stronger. Michelle Hogan is a writer and the author of 13 books including the 2005 bestselling memoir, "Without a Net: Middle Class and Homeless (With Kids) in America." Hogan studied English at American University and has been writing professionally since 1998. Her work has appeared in "The New York Times," "Redbook," "Family Circle" and many other publications. 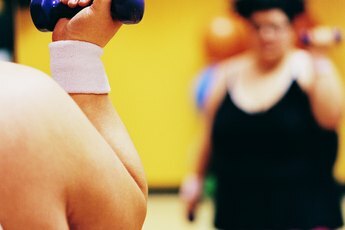 Are Kettlebell Snatches Better Than Swings? 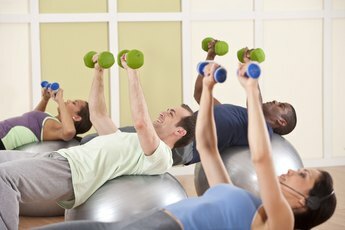 What Are the Benefits of Dumbbell Swing Exercises?